At yesterday’s summit meeting in Pyongyang between North Korean leader Kim Jong Un and South Korean President Moon Jae-in, the defense ministers of the two countries signed an important agreement to reduce military tensions along the two sides’ heavily militarized border. As of November 1, no-fly zones will be established along the border and both sides will halt artillery and other military drills close to the demilitarized zone (DMZ) separating the two countries. The North and South also agreed to dismantle several of the heavily armed guard posts they have each constructed inside the DMZ and to create a maritime peace zone in the West Sea (Yellow Sea). These military confidence building measures (CBMs), and others that are under discussion to reduce border tensions and build mutual trust, such as banning the entry of warships and live-fire exercises around the Northern Limit Line (NLL), are historically significant and lay a solid foundation for more far-reaching measures to reduce the risk of a surprise attack or inadvertent conflict. The US and the rest of the world have been fixated on North Korea’s denuclearization—and the agreements that were announced yesterday on denuclearization have garnered most of today’s headlines. But a “bolt out of the blue” North Korean nuclear attack on the United States, which would be suicidal for the Kim dynasty and his country, has always been a fantastical scenario. The most likely trigger for any large-scale conventional conflict between North Korea and US/ROK forces has always been a local incident or accident that escalates out of control. Further mitigating these risks, which reflects the shared commitment of both leaders to completely remove the threat of armed conflict and the fear of war from the Korean Peninsula, should continue to be a high priority for North and South Korea as well as for the United States. Indeed, it is hard to visualize a sustainable peace on the Korean Peninsula that does not reduce the North’s conventional military threat to South Korea or include new mechanisms to deter and manage crises and prevent or control escalation of a conflict. The CBMs that were announced yesterday were positive steps in this direction, and it is noteworthy that they will actually constrain military operations on both sides and not just provide greater transparency about these activities. 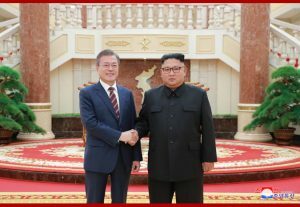 The Trump administration should encourage Moon and Kim to continue down this path independent of progress toward denuclearization or a new peace treaty for the peninsula to replace the 1953 Armistice Agreement. The two countries should also eventually set their sights higher to make the peninsula, in their words, a “land of peace.” Given the great wall of mistrust that Moon and Kim are attempting to tear down and the still fragile North-South relationship, the two leaders are right to adopt an incremental, step-by-step approach to CBMs and not burden their dialogue with unrealistic ambitions. But as the mutual mistrust melts and both countries create a successful track record on implementation, they should consider a more robust CBM agenda consisting of: 1) more aggressive measures to eliminate the NLL as a flashpoint for North-South conflict; 2) greater transparency and information sharing on military plans, programs, and operations; and 3) constraints on military movements and activities to reduce the risk of a North Korean surprise attack. The two Koreas, beginning this past April in their Panmunjom Declaration, have taken ownership of their own security dialogue and, with the announcement yesterday on tension reduction measures, are now fully vested in this process. The Trump administration should be doing everything it possibly can to empower both countries to achieve success.